A very special night at the BB&T centre on Saturday as the Florida Panthers welcomed their largest home crowd in a very long time. The announced home attendance was a regular season record of 20,817, perhaps a strong indication that the NHL can work in South Florida if the fans see a winner on the ice. Among the crowd were a lot of Red Wings fans and a surprise special guest. The appearance of “President Frank Underwood”, unfortunately, didn’t help much as the Panthers dropped a 5-3 decision to a desperate Red Wings team. Still, the Cats go into the final 10 game stretch of the season with a slim 2 point lead atop the Atlantic Division, and control of their eventual playoff seeding in their own hands. The last 10 games are essentially a tale of two months. The Panthers’ schedule indicates the next three games in March are the toughest of the bunch with the New York Rangers, Boston Bruins and Tampa Bay Lightning, all on the road, on the schedule with home games against the Toronto Maple Leafs and New Jersey Devils to close out the month. When the calendar flips to April, the Panthers have five games remaining, all against teams that are jockeying for position in the draft lottery and have, for the most part, been dreadful in their last 10 games played. I don’t think the Panthers could ask for a better schedule to close out the season but they’ll have to improve their defensive play and goaltending beyond what we witnessed Saturday night. With a playoff berth all but assured (Sports Club Stats has the Panthers with a 99.6% chance of making the playoffs and a 56% chance of winning their division), fans in south Florida have to be hoping that the Cats can finish strong, grab the division title and avoid a tough matchup in the 1st round of the playoffs. As things sit right now, the Panthers would face the New York Islanders in the 1st round. 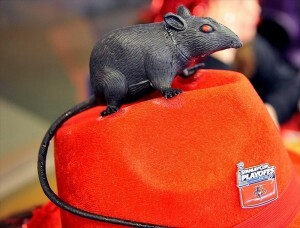 While the Islanders are far from a pushover, the Panthers have taken the season series with the Isles 3-2, and may represent the best chance the Cats have of advancing to the 2nd round, an eventuality that the Rat Pack must be avidly anticipating after the playoff problems of the last decade. If last’s nights record-setting attendance was any indication of the soaring interest in the Florida Panthers, an appearance in the 2nd round would be sweet music to the team and its ownership. A key to a successful 1st round might well lie in getting Roberto Luongo some rest in those 5 April games. Luongo has appeared in 56 games this season and didn’t look sharp in the loss to Detroit. Backup goaltender Al Montoya has a very tidy 10-5- 3 record this season with .924 save percentage so should be able to spell Luongo off in the final 10 game stretch. And you would think a few other veterans would benefit from a few days off before the post season kicks off, so locking up the division championship earlier rather than later would be extremely beneficial. The upcoming weeks’ results should provide a pretty early answer to that situation.